Recently, I made a batch of bagels and posted a bit about them over on Reddit, here’s the much more expanded version, with recipe! It’s out of BREAD by Jeffrey Hamelman. These are regular yeast based; Instant Dry Yeast here, specifically. I also make sourdough bagels which I like better but I didn’t have my sourdough prepped in time. That recipe is here, should anyone want to give them a try. Malt Syrup or Honey, 113 g per 4 litres of boiling water in a very large pot. Possible toppings you may also want to use: Sesame or poppy seeds, Coarse salt, other seeds you like. Also: cornmeal (US) or maize meal (UK) or coarse semolina for sprinkling on your parchment covered sheet pans. If you have a stone for your oven, get it in about 45 minutes before the baking stage to preheat (500ºF/260ºC). These bagels want an overnight refrigerated proofing; schedule your baking (and fridge space) accordingly. Mix all, except the malt/honey (for the boiling stage), in a stand mixer for about 3 minutes with a bread hook. Mix just until the ingredients come together. NOTE: Be aware that this is a VERY stiff dough so keep an eye or hand on the mixer to see that it’s not overheating or straining too much. If it’s getting close to dying or overheating or smelling like the motor is about to burn out, stop and mix by hand. If it’s doing ok but warming up a lot, stop and give it a 5 minute rest before going on to mixing stage two. You could, in fact, do this whole thing by hand and forgo the mixer entirely. Next, mix the dough at speed two for 3 to 5 minutes. Same warnings apply, and more so due to the longer and faster mix time. You want the dough to be rather smooth but well developed. You can stop after a bit and finish by kneading the dough by hand on a dry, flourless counter. Once the dough is ready, lightly oil a bit of your countertop, plop the smooth ball of dough, rub a little oil on that too and cover with plastic or your inverted bowl. Let proof at room temp for about one hour. Because this is such stiff dough, there really won’t be much increase in size. After an hour, uncover the dough and scale it out into 12 equal pieces. I got about 120 grams per; the small bit remaining at the end I roughly chopped into tiny bits and shared amongst all 12 pieces. Cover your lumps under a bit of plastic to avoid drying while you continue. Take each chunk and press it into a rectangular shape, then roll up that shape into a fat cigar. Then roll that cigar into a longer rope about 10 – 11” long (25 – 28 cm). Pop that rope back under the plastic and repeat until all your lumps are ropes and back under the plastic. Take a rope and, wrapping it around your hand, form a loop with a few inches of each rope end overlapping at your palm. Roll this joint back and forth on your dry counter to seal them together. If you dough is too dry, rub a little water on the ends before sealing so they stick together well. 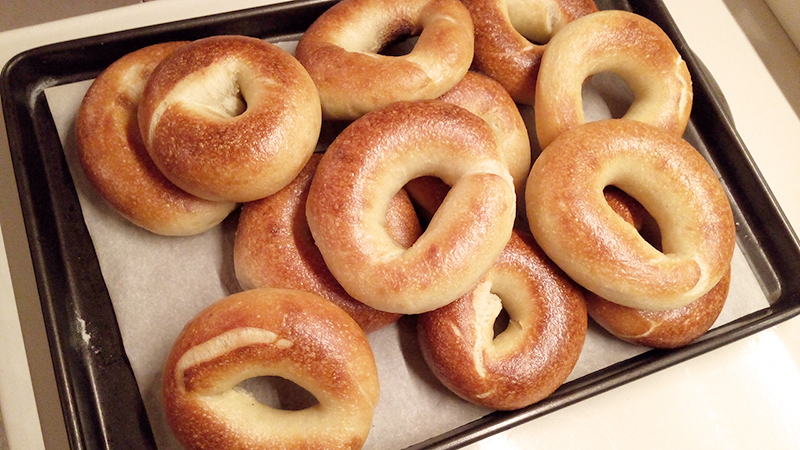 Once rolled, place the finished bagel onto parchment covered sheet pans that you’ve lightly sprinkled with cornmeal. Cover this with plastic as well so they don’t dry while you finish the remaining ropes. 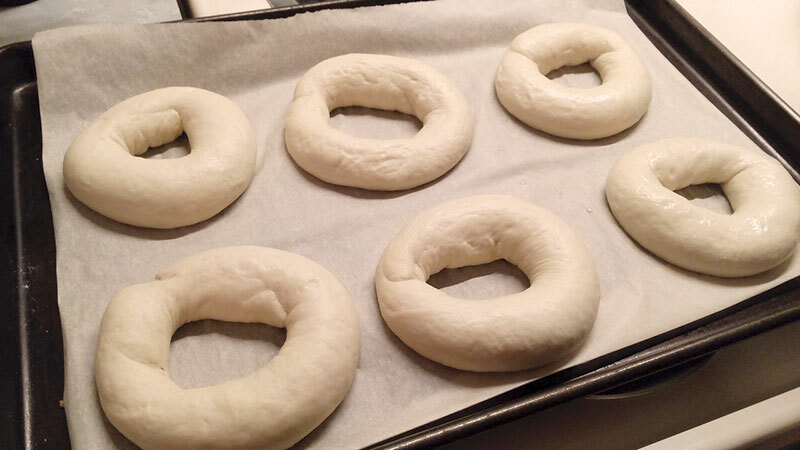 When you’re done shaping your bagel rings, place them in the refrigerator to proof overnight or at least 6 hours. Preheat your over to 500ºF/226ºC, preferably with a baking stone in. If you don’t have a baking stone, that’s fine too; you’ll just bake the bagels on a sheet pan. Your oven rack(s) should be close to the centre. Get a very big pot of water on the boil. You want a pot large enough to take as many bagels at the same time together. Add your malt syrup or honey to the water. If you’ll need to boil the bagels in a few batches, have a large bowl of ice water ready as well to plunge you boiled bagels while you boil the rest. Get any selected topping(s) you plan to use ready: put a bunch of the topping on a plate. You’ll drop the wet bagels face down into the seed in a bit. 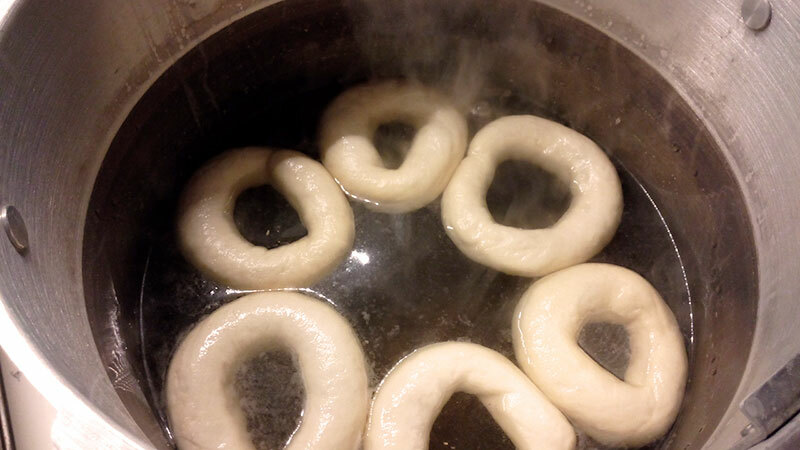 With your water at the boil and sweetened and your oven well preheated (give it at least 10 – 15 minutes more than when it claims it’s ready, and definitely 45 minutes if preheating a stone) you can take one of your proofed bagel pans out of the fridge. Drop as many bagels into your pot as will fit comfortably and let them boil for around 45 seconds, flipping them over about halfway through. 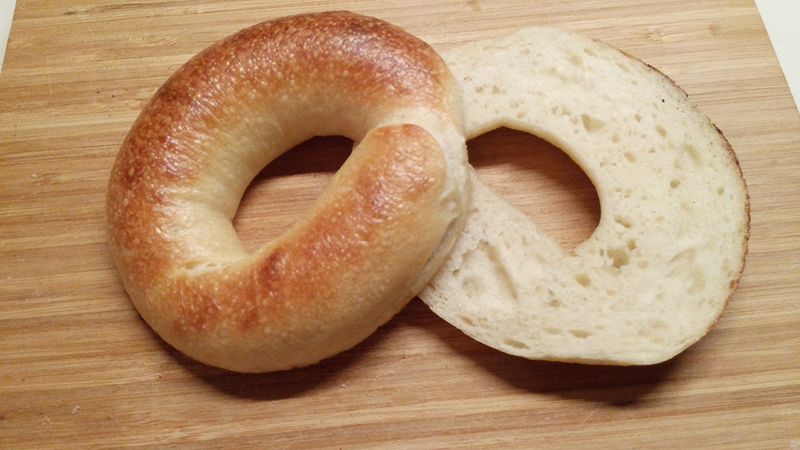 Remove each bagel and drop it into to ice water to chill and wait for batch #2 OR place the bagel, bottom side down onto your cornmeal-prepped bake pan. If you’re topping them, drop the wet bagel, good side down, into your plate of seed, then bottom side down on the sheet pan as well. Once your bagels are all boiled, seeded if desired, and panned onto the cornmeal parchment, they can go into the preheated oven. Because they do expand somewhat even form the size they get after boiling, be sure to give them a little space between each one. At this point, there are two ways to go: with or without baking stone. WITH: Transfer the bagels, parchment and all (remove some of the excess cornmeal to avoid burning) right onto the baking stone. Bake for about 14 – 17 minutes, quickly swiping the front row of bagels with the back row on each rack midway through. WITHOUT: Slide your baking sheets of bagels right into your oven. Bake for about 14-17 minutes, switching the top rack of bagels over for the the bottom rack and back to front as well midway through. Bake until the bagels are a nice golden brown; if it’s sooner or later than the recommended time, that’s fine. Just make sure they’re not too pale. Cool on a wire rack. The crumb texture will be quite soft while they’re still warm; it will get a bit denser when cooled and the starch has solidified fully. Slice and toast, smear with butter, cream cheese and or your fave topping. Flour to water is 58.1% so just a bit wetter than what you use. The bottom line, as always, is if you’re happy with the final results, then you’re doing it right. I wanted to thank you for your sourdough bagel recipe! 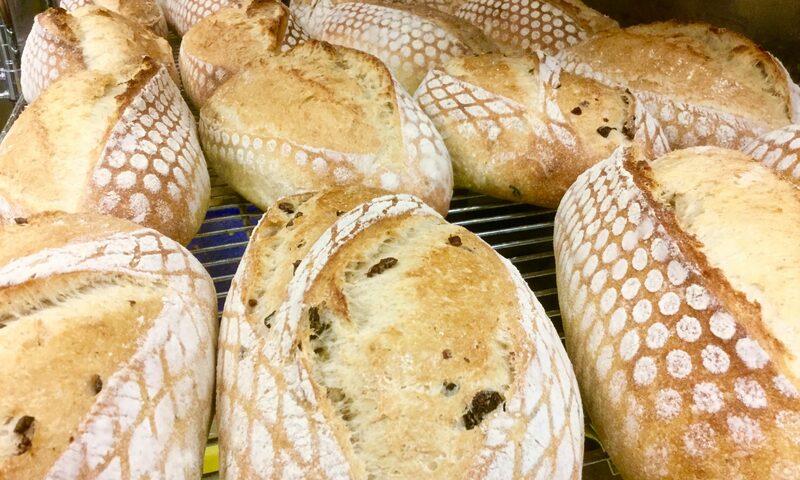 I tried making them after I made Peter Reinhart’s version, and I prefer the sourdough version! I sprinkled some sea salt on them, and they came out terrific!